The Letter of Intent Signing is an opportunity for students at the National FFA Convention and Expo to declare their future as an agriculture teacher! The signing event is open to high school seniors planning to major in agricultural education and teach agriculture as a career or current college students transferring to study agricultural education. Follow this link for more information and to sign up today! Please direct any questions to Elisa Russ, the National Teach Ag Campaign Intern, at emruss@iastate.edu. Presented by Zoetis, the Veterinarians on Call YouTube channel features real-life vets doing a variety of tasks. This week, Dr. Randall examines pet cat Mickey for chronic pneumonia, which if not treated promptly can be fatal. Click here to watch the video. The 2017 SAE Grant application is now open. Supervised Agricultural Experiences (SAE) are a core part of agricultural education. Thanks to our sponsors, 152 SAE grants worth $1,000 each are available this year to help FFA members start or expand an SAE.To apply, members must log in to their FFA.org account. The application can be accessed through the Application Center; click Open Your FFA Dashboard on the top right of the website and select SAE Grant in the Apply Now toolbox. This link will take you to the Application Center where you can access and complete the grant application. You can also access the application from the SAE Grants webpage (or from the FFA.org homepage, select Participate then Grants & Scholarships then SAE Grants). If you are an AET user, you can access the application from the AET website by clicking on Reports, then Degree/Application Manager then selecting SAE Grants from the drop-down menu.Applications are due online by Nov. 15, 2017, at 5 p.m. PT. SAE Grant recipients will be announced in late December this year. Contact Brett Evans, SAE Education Specialist, at bevans@ffa.org or 317-803-4233 for questions. Browse through your free resources, bookmark the webpage, and share with fellow agriculture educators! If you missed the live stream, the AgExplorer virtual field trip to Syngenta’s Research and Development Center is now available on-demand! Learn how analytics, chemistry, agronomy, and biology are revolutionizing the way food is grown. Coming in November: Our next virtual field trip will focus on animal systems at FFA sponsor, Zoetis. More details coming soon. New My Journey Content Now Available! Check out free planning tips, tools and lesson plans available this month. Visit the Explore webpage to find a new Supervised Agricultural Experience lesson about biomedical research, a lesson on careers at ADM, and step-by-step guides for various FFA educational resources. Head over to the Build webpage for a great educational resource from Journey 2050 and important safety information to know during the National FFA Convention & Expo. On the Connect webpage, you will find a current event worksheet and article about AgCo Innovations in Manufacturing With Glass, information about the Living to Serve Day of Service Mini-Grants, and career opportunities. Don’t forget to incorporate AgExplorer using the implementation guide with lesson plans on the Explore webpage, and be sure to look through past months’ ideas in our Archive. Does your FFA chapter have a service event that they want to host over the winter months or during FFA Week? This is a reminder that National FFA now has Day of Service Mini-Grants available to middle school, high school, and collegiate/alumni chapters to impact your community in one of four focus areas: Community Safety; Hunger, Health and Nutrition; Environmental Responsibility and Community Engagement.Applications submitted by the last day of each month are reviewed and awarded by the 15th of the following month. Thus, applications submitted by October 31st will be awarded by November 15th. To learn more about the grant, and to access the application in English or Spanish, visit www.ffa.org/livingtoserve/grants. DuPont Pioneer will award $175,000 in grants to agriscience educators to fund training and classroom resources that will help them implement advanced agricultural curriculum. Grant recipients are teachers who are implementing Curriculum for Agricultural Science Education (CASE) in their classrooms. Click here for a link to the application. The deadline to apply is November 13th. CASE will be located at booth #4727 in Teacher’s World. Visit the CASE booth to learn about current and upcoming CASE courses, CASE Online, Lead Teacher opportunities for 2018, and much more. CASE will also have the most up-to-date listing of 2018 CASE Institute dates and locations posted at the booth.CASE certified teachers who visit the booth will receive a CASE window cling and 2018 CASE Institute pocket schedule, while supplies last! The CASE VIP Lounge will have seating reserved for CASE certified teachers to catch up with colleagues or rest their feet. Be sure to connect with CASE affiliate institutions, sponsors, and partners who will be recognized across the FFA Expo with special banners. Applications to the 2018 Excellence in Action award are open! Advance CTE's annual Excellence in Action award recognizes and honors superior Career Technical Education (CTE) programs of study from across the nation. Applications are due November 15th. Click herefor more information and to apply. 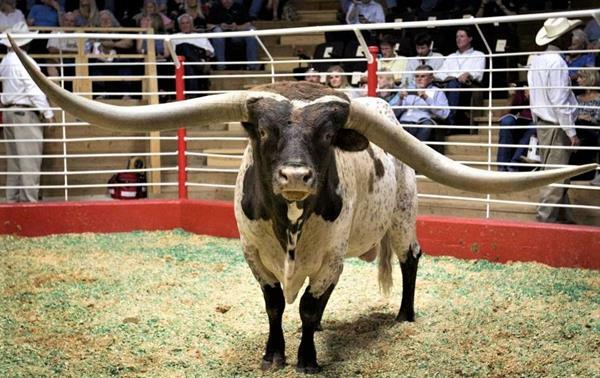 Eight feet of horn and a lotta bull gets sold for $165,000. Friday, October 6, 2017: Farm-to-School programs link students, farmers, and communities. USDA nominees, National 4-H Week, and a bear rides in the fast lane. Check out these and many more ag/science stories.